Looking for a stocking stuffer? Searching for thoughtful commentary on the new atheism? Just looking for a smart, stylish read? 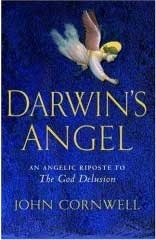 Then John Cornwells Darwins Angel: An Angelic Riposte to The God Delusion is for you. Cornwell, whose reputation as author of the historical potboiler Hitlers Pope at first put me off, won me over with his scintillating, well-informed, even erudite critique of Richard Dawkinss Darwinist atheism. (Readers note well: I ordinarily eschew adjectives, most of all strings of them.) Employing the conceit of an angelic messenger, Cornwell, in a series of short letters to Dawkins, takes up several standard atheist arguments (Gods permitting evil, the meaning of supernatural, the believers and the scientists human need to explain everything, the origin of morality); some of Dawkinss peculiar positions (the utopia that will follow the end of religion, the intellectual inferiority of believers, religion as a bio-cultural bacillusthats right, a pandemic pathogen); some fundamental confusions and deficiencies, e.g. in the use of sources; and some needed antidotes to scientism such as imagination and religious experience. The format and the content remind me of C.S. Lewis apologetics, but devoid of his reductionism and rhetorical sleight of hand, and elevated a couple of degrees of magnitude by its learning and sophistication. I ripped through the book, and when I finished, my only complaint was that in this brief book (only 168 small pages), some insightful arguments, though clear, seemed a bit attenuated. With an angel already on the cover, all it needs to be a Christmas gift is a gold ribbon wrapped around the corners. Happy Christmas reading! *Darwins Angel has not yet been published in the United States, but the book link above will bring you to Amazon.coms UK site. For a young New York seminarian named Gurdon Brewster, the summer of 1961 proved to be life-changing. He was chosen to spend this time with the King family in Atlanta, Ga., ministering to the community of Ebenezer Baptist Church. His experiences in the thick of the burgeoning struggle for civil rights are captured in moving detail in his memoir, No Turning Back: My Summer With Daddy King . He stayed at Rev. and Mrs. Kings home, which afforded numerous golden opportunities to get inside the family history. He had many encounters and enriching exchanges with Dr. Martin Luther King Jr. The author, a white man, was determined, against all odds, to bring together both black and white youth from local churches into a special group for conversational exchanges, bridge-building and recreation. And he succeeded. As a firsthand witness, Brewster chronicles unspeakable abuses, humiliations and discrimination endured by the people he came to know and love, both the youth and the eldersabuses he could not get his head around. One particularly hot day, he recounts, he and the youth group were denied admittance to a coffee shop to purchase lemonade. Then came their exclusion from the town pool. And on and on. No Turning Back takes the reader inside revival meetings, to the pulpit at Ebenezer and on personal visits to the shut-ins, during which Brewster listened to story after story of lifelong misery. Where was the white minister, Daddy King wondered, who would stand up in his pulpit and preach the gospel? Niggers, they would say, stay in your place. Dont agitate. Our nations history is blotted with a very long and dark chapter on repression of freedom and denial of justice. Brewster was awakened for the first time to a situation about which he (and most others at the time) could have no palpable understanding. This book is both disturbing and heartening. In recounting the decades-long struggle of Southern blacks, Brewster has written an eye-opening, moving and inspiring memoir. Upon returning home at summers end, he felt too alone in my ideas and feelings to become outwardly expressive. I now saw the world with new eyes through those whose needs were real and whose transcendent vision of hope drove them forward. The same goes for me. Recently I was fortunate to spend a few days in Santa Fe, N.M., for a meeting of a Catholic lay group. As a longtime fan of Willa Cathers magnificent novel Death Comes for the Archbishop , I was delighted to have the chance to visit the stunning setting of her book, which tells the story of a missionary bishop in New Mexico, and is loosely based on the real-life Jean-Baptiste Lamy (1814-1888). Foolishly, I didnt realize that the hotel in which we were staying, called Bishops Lodge, was the precise spot of the final, glorious chapter of Cathers book, in which the aging priest selects a place to pass the last years of his life. Of all Cathers books, this is the work that is most like a prayer, and her compassionate telling of the bishops joys and heartaches is a profound meditation on a life devoted to God, and a near-perfect evocation of a person who has found a vocation. And, frankly, no one can write a sentence like Willa Cather, one of the greatest American novelists. In the midst of a hectic Christmas season, nothing could be better than sitting down with Cather and letting her tell you the quiet story of her good and kind archbishop. Another antidote to Christmas madness is Henri Nouwens minuscule book The Selfless Way of Christ , recently published (or re-issued) by Orbis Books. The subtitle says it all: Downward Mobility and the Spiritual Life. Here the Dutch spiritual master reminds us of the need not to have it all, but to have less and less, aiming for the freedom that comes with poverty of spirit. Sound depressing? Its not: its liberating. His joyful message is driven home by simple prose and simple examples. The book also provides the answer of what to do with all those extra Christmas gifts youve received: Give them to the poor. Finally, Daniel J. Harrington, S.J., has brought out another gem: Jesus: A Historical Portrait , an admirably concise summary of what we know about what scholars call the historical Jesus. Fr. Harrington, Americas The Word columnist, and professor of New Testament of Weston Jesuit School of Theology, has a knack for making complicated things seem straightforward and scholarly concepts readily accessible. Looking for a way to put Christ back in your Christmas? Why not read about him? Christmas book recommendations should probably tend toward the upbeat end of the bookshelf, somewhere near Charles Dickens A Christmas Carol, since tales of mortality and struggle are perhaps not preferred yuletide reads. I offer my apologies for recommending a book that, despite being haunted by Dickens on almost every page, might come across as slightly less cheery on first encounter: Oscar Hijuelos masterpiece, Mr. Ives Christmas . A national bestseller and a 1996 finalist for the Pulitzer Prize (which Hijuelos had already won in 1990 for The Mambo Kings Play Songs of Love), Mr. Ives Christmas is not a light read, but I recommend it as a terrific holiday book for gourmands of richer, heavier literary fare. Set over seventy years among the ethnically diverse residents of Morningside Heights, its at heart the story of Edward Ives (Eduardo to his neighbors) and his long life seeking to understand the ways of the world, especially the ways in which God has blessed and cursed him through love and loss. Within the first few pages, the reader discovers that Ives was an orphan and his seminarian son, Robert, is dead, murdered three days before Christmas 1967 outside their apartment. Every year the Christmas season reminds Ives and his family of Roberts death. Moving forward and back in time, Hijuelos chronicles Ives memories of his son, his relationships with family and neighborhood, and most of all his lifelong dialogue with God through his long-suffering Catholic faith. Much of the story is told through vignettes that are not tied to any notions of internal continuity, so the reader loops back repeatedly to Ives, learning each time a bit more about his everyday attitudes as well as his spiritual journey. A beautifully written and profoundly life-affirming book of faith, Mr. Ives Christmas might start out as a downer but will ultimately raise any readers Christmas spirits. After no small measure of encouragement from friends, I decided to start the holiday season by reading The Year of Living Biblically: One Mans Humble Quest to Follow the Bible as Literally as Possible by A.J. Jacobs. Jacobs, editor at large for Esquire and the product of a principally secular upbringing, began his journey to live the Bibles dictates for two reasons: 1) to illustrate the absurdity of overliteralizing biblical rules; and 2) to provide his son Jasper with a spiritual and moral center, one Jacobs felt was sorely lacking in his own life. While there is plenty of absurdity to be found (Jacobs literally stones an adultererhe pelts a particularly crochety unrepentant fellow with small pebblesand [rises] up before the grayheadeda task that entails perpetually sitting and standing in a Boca Raton restaurant), most surprising is the sincerity and open-mindedness that Jacobs brings to his quest. Approaching religious tradition and study with an unusual mixture of skepticism and reverence, he studiously avoids stereotyping even the most polarizing groups, such as the evangelical Christians formerly led by the late Rev. Jerry Falwell. Jacobs declines to play upon some of the uglier misconceptions associated with such a group, instead highlighting their kindness and commitment to their faith while acknowledging his struggle to reconcile his fundamental disagreement with their stance on certain issues (e.g., homosexuality). It is this openness to discovery that characterizes most of Jacobs yearlong task as he realizes the value of biblical living, whether its avoiding wearing mixed fibers or thanking God for every breath he takes. As Jacobs concludes in one passage, More and more, I feel its important to look at the Bible with an open heart. If you roll up your sleeves, even the oddest passagescan be seen as a sign of Gods mercy and compassion. That is valuable advice for us all, at this time of year or any other. Christmastime, for me, is a great opportunity for revisiting favorite books in the few silent moments between shopping, feasting and family celebrations. Escaping into old familiar stories is a necessary respite in the hustle and bustle of the season. A book I consistently come back to is The Supper of the Lamb by Robert Farrar Capon. While my parents should be credited for teaching me how to cook, Fr. Capon (imagine Episcopal priest meets comedian chef), taught me how to eat. The stated aim of the book is to teach the reader to prepare one leg of lamb to feed eight people for four separate dinners. But while he dices and dishes, Fr. Capon is arguing a more delicate point: how we eat is as important as how we pray, and almost always as personal. Thus, he articulates a Christian imperative to cook, connecting human hospitality with a gourmet eschatology: gather the people, spread the table, share the joy of the heavenly banquet to come. In Capons kitchen, even the most banal of daily necessitieslike eating leftoverscan be elevated into a devotional Christian practice. Read this book for the invaluable lesson on how to throw a dinner party, but re-read it for the lesson in Gods grace we can experience while breaking our daily bread. This timeless argument for Christian cooking, eating and hospitality spreads over 16 chapters (plus recipes) and will leave you fully nourished. It may read like an entertaining cookbook, but at heart, it is a kitchen manual of systematic theology that anyone with an appetite will devour. Whats the use of stories that arent even true?--a painful question for any fantasy fan to consider--is addressed by Salman Rushdie in his novel, Haroun and the Sea of Stories . I read Haroun for my literature class entitled The Enchanted Imagination--and enchanted I was. I was immediately swept away into an alternate world that Rushdie so easily and fancifully creates. It is a story about a young boy named Haroun who, in light of recent tragic events, asks his father Rashid the very question mentioned above. Rashid is a renowned storyteller and hence becomes pessimistic and depressed when he hears his sons skepticism. As a result, Rashid loses his power of storytelling, which leads to dire consequences, including Harouns immense feelings of guilt. The boy realizes that, since he himself fragmented his fathers imagination, he alone must try to revive Rashids narrative passion. This leads Haroun on a whirlwind adventure that is heroic, exciting and, most of all, transformative. Rushdies brilliance lies within his ability to create new creatures that are believable and diverse. He also plays with language on a multi-linguistic level, giving characters and places names that have underlying meanings in English and Hindustani. My favorite phrase is what he terms a P2C2Ea Process Too Complicated To Explain. I recommend this book for everyone who wishes a little escape from everyday life. May you have a Blessed Christmas, one where we can enjoy the beauty and majesty of all P2C2Es. This article also appeared in print, under the headline "Christmas Reading Picks," in the December 17, 2007 issue.